Actor Tom Chambers, best known for his role in Casualty and as a BBC Strictly Come Dancing winner, joins Emmerdale as Leyla Harding’s new fiancée Clive. 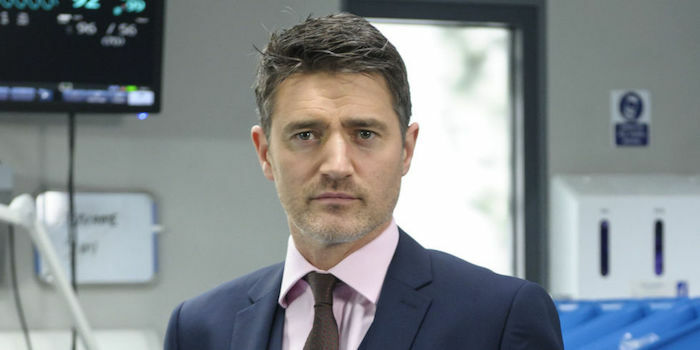 Actor Tom Chambers, best known for his role in Casualty and as a BBC Strictly Come Dancing winner, is joining Emmerdale as Leyla Harding’s mysterious fiancée Clive. Tom Chambers, who played Dr Sam Strachan in both BBC hospital dramas Holby City and Casualty, appeared in Holby from 2006 to 2008. 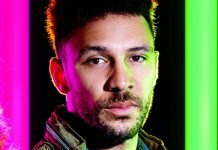 The actor then reprised his role in a guest appearance on sister show Casualty in 2016, before settling in for a more permanent stay in February 2017 and leaving later that year. He arrives in the Dales next week and immediately sets tongues wagging – mostly because the villagers questioned his existence! 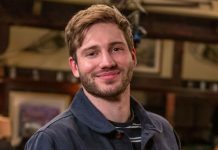 Wed 24 Oct 2018: Leyla is shocked when Clive suddenly appears in the Village, What does he want? 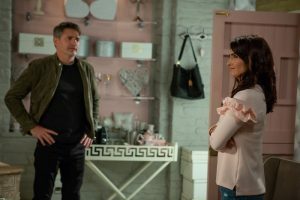 When Leyla Harding, played by Roxy Shahidi, returned to Emmerdale wearing a diamond engagement ring, several people including her ex David Metcalfe (Matthew Wolfenden) and his estranged wife Tracy (Amy Walsh) suggested that Leyla had made the mysterious ‘Clive’ up to take the heat off her affair with David. However, they are proved wrong when Clive arrives in the village, looking for his fiancée! 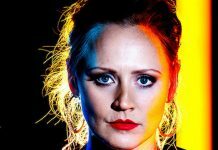 The week starts as Leyla and her business partner Megan Macey (Gaynor Faye) are shocked to find a strange woman called Suzie ransacking the house but it seems Leyla knows who she is. 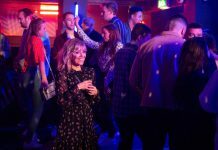 When Suzie grabs Leyla’s handbag and a load of jewellery and a wad of cash spills out, she claims that Leyla stole them along with her fiancée, Clive. 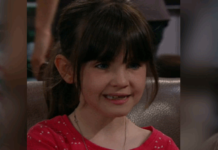 Heartbroken Leyla relents and gives Suzie the jewellery so she leaves. 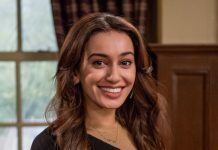 Its seems like Leyla knows how to pick them as she declares her love for Clive, much to Megan and Vanessa Woodfield’s disbelief. Having slept on it, Leyla awakes the next day determined to move on and focus on her career but Suzie has put paid to that after leaving scathing reviews about Take a Vow online. Things get worse when clients start cancelling leaving Megan fuming. Wed 24 Oct 2018: Clive begs for a chance to explain things. Leyla is torn but will she forgive him? 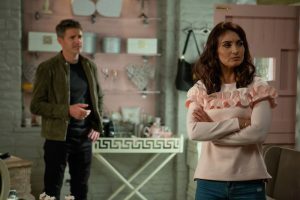 Leyla is also angry for falling for Clive and believing that he loved her but when Clive suddenly appears and begs for a chance to explain things, will Leyla forgive him? As with all of Leyla’s relationships, her engagement to Clive is not without drama especially when another villager sets eyes on him. Is Clive in love with Leyla or is he toying with her affections? 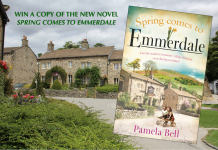 How long Clive and actor Tom are staying in Emmerdale is yet to be confirmed but however long, it won’t be a quiet visit. 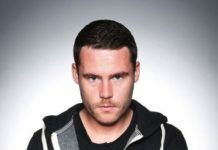 As well as appearing in Waterloo Road, Tom won the sixth series of Strictly Come Dancing with professional dancer Camilla Dallerup back in 2008. 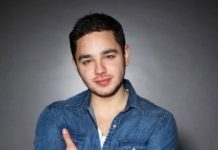 He has since performed in the West End in a number of musicals including Top Hat and Crazy For You. 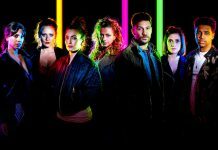 Don’t miss Emmerdale, Monday to Friday at 7pm with an additional episode at 8pm on Thursday, on ITV, to find out more.